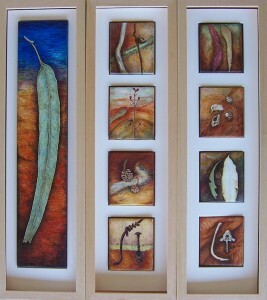 These are a framed series of egg tempera paintings inspired by all the bits of Australia that found their way into pockets and suitcases. 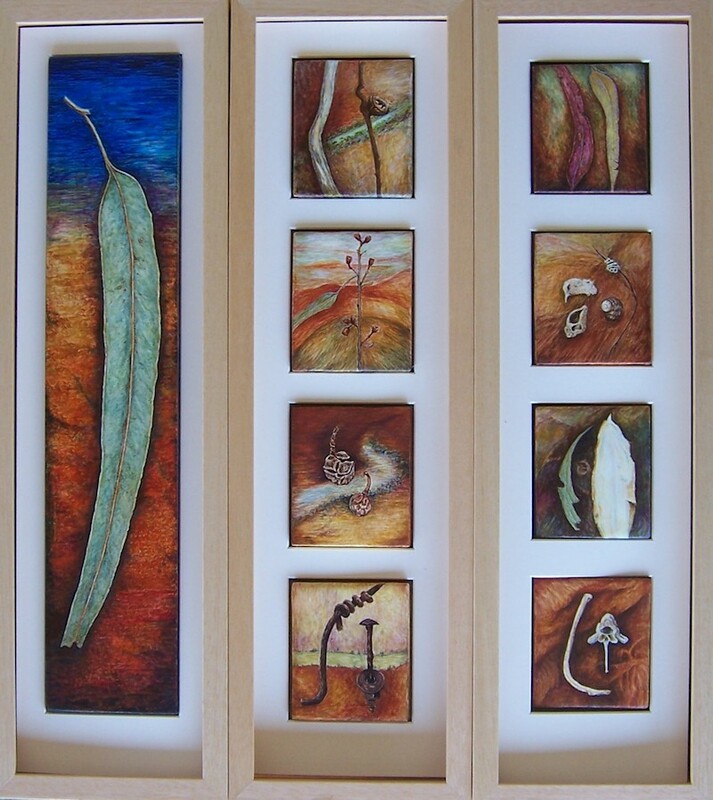 I loved handling them all again to do first silver point drawings of each item and then putting them into a setting over the land of Australia inspired by photographs I took from a few thousand feet above. Each one is a precious memory of my time down under. 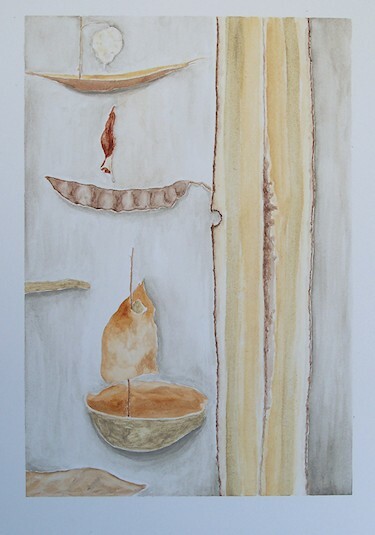 There are two of these large watercolor images of dried pods, leaves and stems that I have saved and then rearranged into something else. In this case they are floating boats that appear to just be passing through. 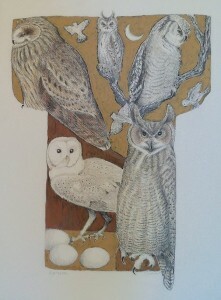 The only paints used on them are the watercolors made from the soils here at home and from my travels. The luscious greenish grey is from Puget Sound and is so viscous on the paper. In an earlier series of six kimono-shaped graphite drawings I chose to draw subjects that would go with the word “Night”. 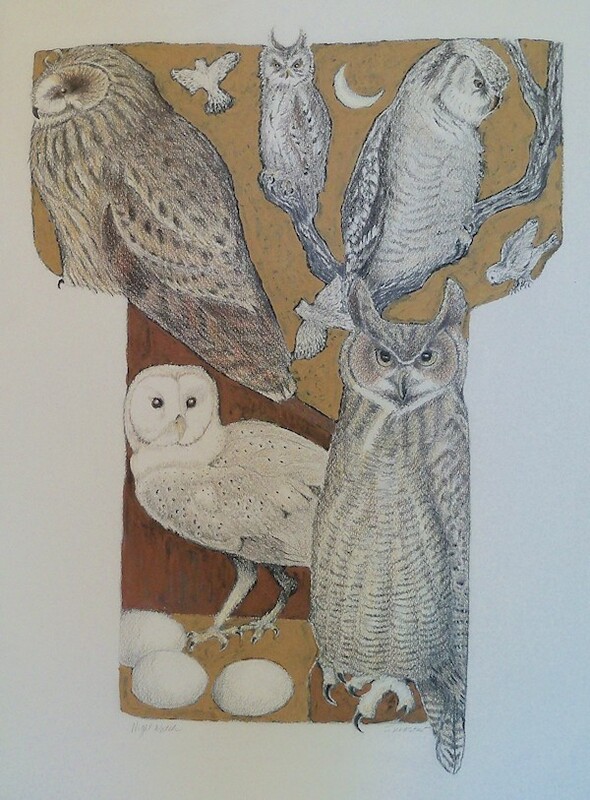 Night Vision (Insects), Night Latch (a gated community in the hills), Night Fall (falling leaves in a storm), Night Tides (boats and shoreline), Night Passions (roses in a moonlit garden) and this on titled, Night Watch of several different kinds of owls. Night Latch sold out of an exhibition that featured my work. Night Vision was sent to New Zealand and Night Watch has been reworked using thick gouaches made from local earth pigments.